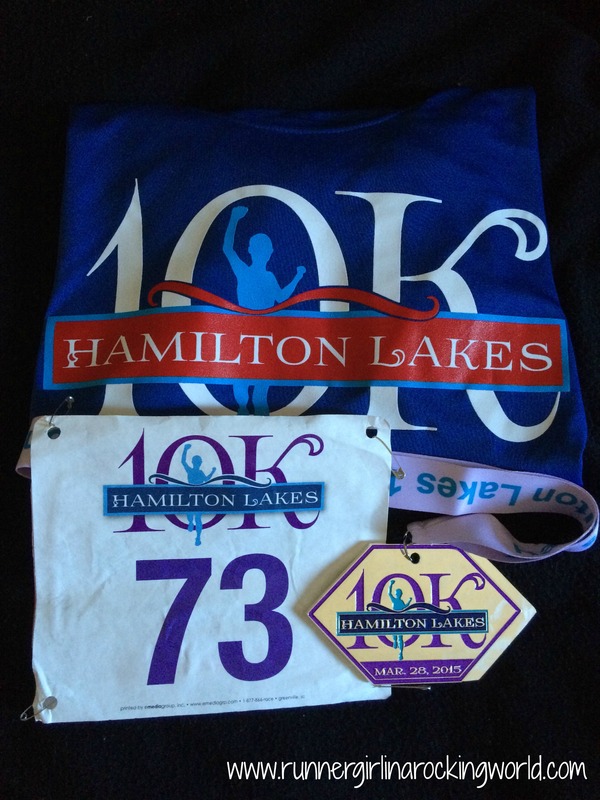 This weekend, Christine and I ran the Hamilton Lakes 10K. We signed up a while back on a whim after the City of the Arts half was cancelled and we were no longer pacing. We found a great deal and thought why not?! If nothing else, we’d get a tech tee and add another medal to our collection! I had met Cara and Katie earlier in the morning to run. I hadn’t planned on running 7 miles, but I felt really good going into the race. The start is at 3pm, which is a hard time for me to have a race. I just don’t know what to do with my food and body maintenance going into it. I did a good time this year and had a real breakfast after my morning run and a snack before going to run around 1pm. Christine and I met at 2pm so we could find a good parking spot and meet up with Christie who was coming to cheer for us. We also had a few other friends running the event and we all hung out before the start. There was a brief meeting with the race director and we lined up shortly after to start. The course had changed from last year and I was excited to run the new course. The neighborhood where the race takes place is one of our favorites to run through. There is also a trail that we run on from time to time around the lake. On each lap, the last mile was always a slight grade climb. We hit Starmount Rd and we just settled in. We would recover on a few flatter sections and continue to keep a good steady pace. 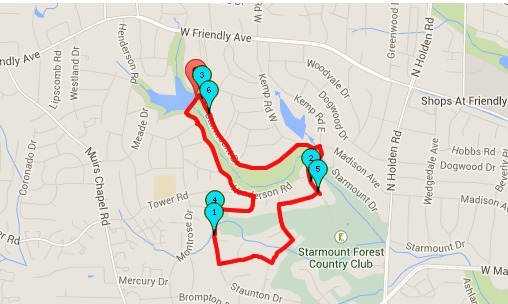 We came through the first loop (3.2 miles) at 30:52. We now knew the course and we would use that to our advantage. We kept trucking along the next mile and at mile 4.2, I knew that with two miles left, we could finish under an hour if we kept this pace. We wound around the neighborhood and came right back to that last mile climb. Right along that part of the course, we were greeted by our friend, Amy! She was at the perfect place. We had about .5 of a mile left and it was just the boost we needed. I kept an eye on my watch at this point, knowing that we were super close to that hour goal. We carried on and could see the turn to take us to the finish line. At the top of the hill, Christie and Lori were up there cheering us on! We made the left and headed towards the finish line. We had 30 seconds to get to that finish line! I yelled at Christine, we have 30 seconds, go!! We picked up our pace just a bit and finished in 59:52! We were stoked!! Going into the race, both of us thought we’d be closer to 1:05 so to finish under an hour was an absolute treat!! We grabbed our medals, took some pics with friends, and headed off to find warmer clothes. While the weather was perfect for racing, we got super chilly afterward. We hung around the finish line party, chatting with other runners, and grabbed a much needed Pepsi! You know I love a soda after a race! One of our friends was looking up the results and we asked him if he’d look up our times too. Going into the race, we knew that Christine’s age group had 7 runners signed up and that if we ran smart, there was a chance she could finish top 3. The results came up and she had done it!! She was 3rd in her AG. I was so excited for her! We stayed around for the awards ceremony. The race director came down and announced that there had been a glitch and that a chunk of times had disappeared and were written in some crazy code. They would have to fix them and would post the final results online. They would have to hold on the award ceremony. Everyone was very understanding and it did not put a damper on the race, but man, I so wanted them to call Christine’s name so she could go up there and get her award! We went out to celebrate after! We figured since we saw the results online before the glitch happened that Christine was good to go! We checked the results one last time online while out to see if any changes happened and we saw that Christine had moved up to 1st in her AG!!! We held our breath that it would stick. Around 10pm, the final results were posted online and she had successfully claimed 1st place. It was official!! I woke up the next morning to see the good news! I am so proud of her!! The course is a really fair 10K. There are just enough hills, nothing to awful, but there are some really good downhill stretches too. The water stations were fully stocked along the course, although we did not stop at any of them. There were many supportive volunteers along the course, encouraging runners the whole way. The course was well marked and the miles were clearly marked with big flags. The post race celebration was better than some larger races we have run! There was plenty of pizza and soda. The medals and tech tee are awesome! I love supporting a local race and can’t wait to run this one again! I could say the result glitch, but honestly, that happens sometimes. It was crazy windy (20 mph winds at race time) and that kind of thing can mess with timing. I really don’t think it was enough of an issue to call it a con. Everyone seemed to take it in stride and even online it didn’t look like anyone complained about it either. Looking for more running-related posts, check out Tuesdays on the Run here. See what other runner’s are sharing! Thanks!! I did a pretty good job pacing!! This same race is my surprise 10K PR (51:37) from last year, but I enjoyed this time way better. I love pacing way more than racing! Congrats on your sub-hour 10K! I’ve only run one 10K and I loved it, even though the weather was pretty harsh! That medal is gorgeous too! Thanks!! 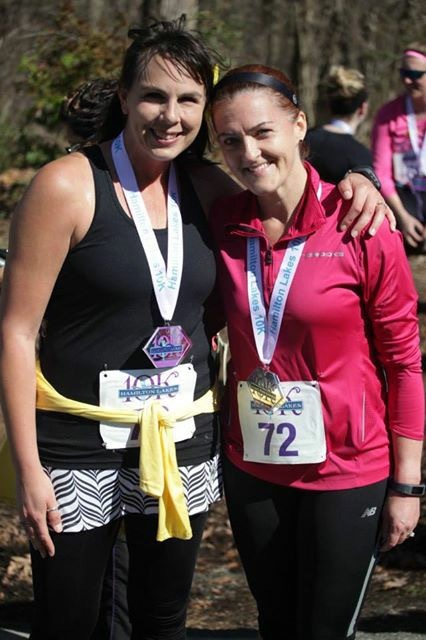 I enjoyed pacing my friend this year!! I raced it last year and snagged a surprise 10K PR. Pacing beats racing for me now. Congratulations on completing your 10k. And under an hr, that’s great. Way to go! Thanks!! I enjoyed pacing my friend!! I races this one last year and ended up with a unexpected PR. I had way more fun pacing then racing this year. All these pictures with sunshine and beautiful weather are actually kinda making me want to go out and run again (this is a big deal, because I haven’t really gone running since 2015, hahaha). Weather like that helps a lot when it comes to running. 🙂 We’re lucky here in NC that even through the winter, we end up some sunny days! Yay congrats on a great time for your 10k! 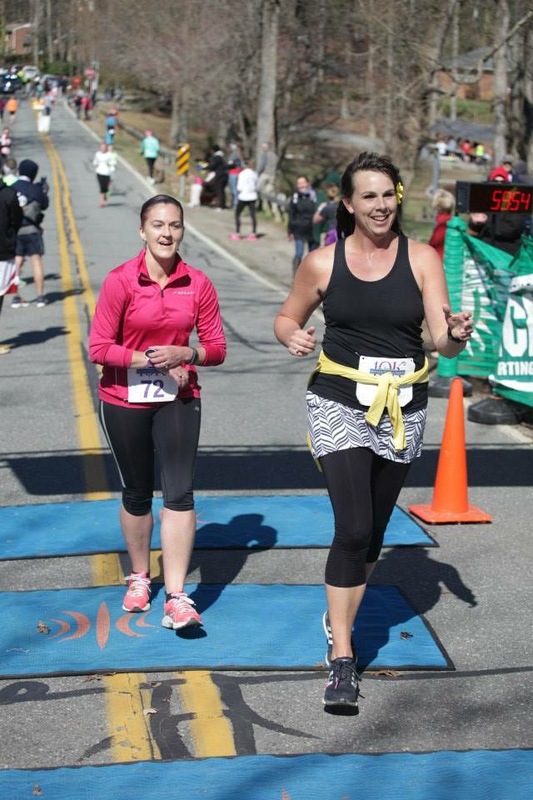 And you also look really good in your finish line pic! I don’t usually look good in regular racing pics. I did the same thing you did after Savage this weekend: we got a cold front so I ran and then put my jacket on afterwards because we were chilled from being wet from the water obstacles. It’s about time this temp picked up!! Awesome job! The 10k is my favorite distance to race. I hit a sub-one hour once at the 10k distance but it was in training, not in a race so that’s a huge goal for me! 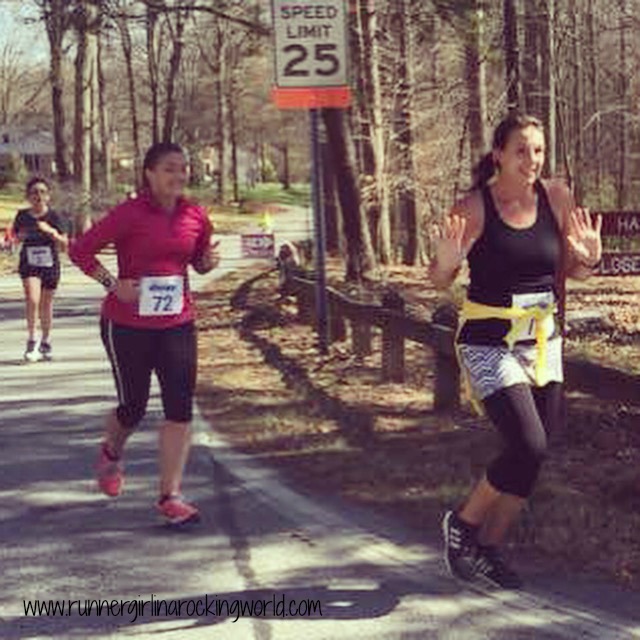 Great race recap!! Great race recap and congrats on a sub-1-hour finish! Congratulations on the sub hour time. That’s a great medal too! Thank you!! The medal is part of a bigger medal in the series. Unfortunately, I couldn’t run all of them. It’s nice to get a medal for a 10K. It doesn’t happen often. congrats on your time! I would love to get a 10K in at under 60- I think I am at 1:03 so almost 🙂 I would have been a little confused with myself on the 3pm start time- I don’t ever run at that time so that is a little weird but it looked like a beautiful day!!! You are so close!! Christine was hoping for a 1:05, but I knee she had an under hour in her! 🙂 I guess in the end the afternoon race worked for us. Who knew? !